There are more 'make money online' adds on the internet than there are toddler tantrums in Target. (Read: a whole effing lot.) These are the only ones that have ever actually yielded real, cold, hard cash. "If you've ever tried to raise a family on a budget, you know that feeling where it's 3 am and you wake up to another financial worry stress dream and start googling "how to make money from home online". It's not like you don't know what they're going to say. Click here to fill out a billion online surveys for under five dollars. Pyramid scheme here! Join this multilevel marketing thingy-ma-bob over here and fill the trunk of your car with unused cosmetics. Do you want to spend your life transcribing audio files for $0.30 per minute? Great! Click here. Nope, jail time, nope, and hell to the nope. So you switch over to your Pinterest app and lull yourself back to sleep with pictures of kitchens way more organized than yours. Can You Actually Make Money for Free? Wow, that was a shorter blog than usual. What's for lunch? Just kidding. Sort of. In order to make money, you will have to either do something or pay something. I'm going to teach you the most important thing I've learned in 20 years of internet addiction, 12 of which I spent as a web developer and/or online marketer. If you read nothing else today, read the following rule. Memorize it. Needlepoint it onto a throw pillow. Whatever it takes. This one will save you lots of heartache. The Golden Rule of the Internet: If it sounds too good to be true, it is. If someone is promising you crazy money for no effort, they're most likely lying to you, selling you something, or pretending to be a Nigerian prince. The only way to make sure you don't get taken advantage of is to look at the "angle" of the person/company that is offering you money. If you can see how they're making their money and why it's advantageous for them to be offering you money, you are much less likely to get fleeced. So, with that little lesson out of the way, I now present to you the only ways I've ever actually made money online. Just to define that for you, "made money" means I have gotten real, physical checks or real, quantifiable deposits into my bank account. None of this earning bonus points or unlocking discounts business. I mean actual, verifiable dollars. I cannot overstate to you how much I love Ebates. That is an actual screenshot from my account. 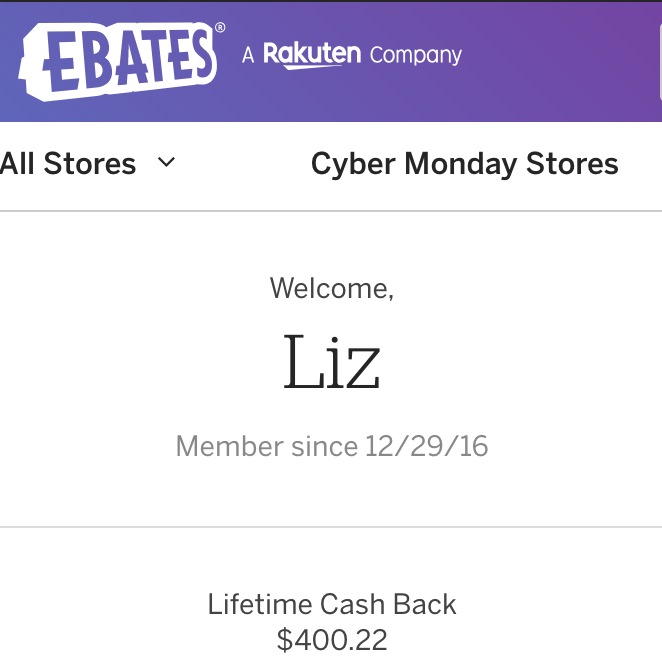 Yes, in the not quite two years I've been an Ebates member, I've earned just a little over $400. In checks they mail to my house. None of this "earn free gift cards to this place you'll never actually go to" stuff. These guys actually mail checks like an employer. Here's how it works. You install a plugin on your browser (they support Chrome, Safari, Firefox, Edge, and *gasp* even the archaic dinosaur Internet Explorer) and it can tell when you visit the website of one of their affiliate stores. When you go on a store they have a deal with, the little icon pops up saying "hey click me and you'll get money" (or something like that, I may be paraphrasing a bit). You click the button and it automatically gives you a certain percentage (it varies by store) of whatever purchase you end up making in cash back. You see your cash back pending after a day or so, but the checks come every quarter. If you haven't tried this yet, you definitely should give it a go. There are no fees. You pay nothing down. You don't need to give them any credit card numbers. Just set up the plugin and start earning. Yes, by the way, these links I'm giving you are affiliate links. That means I do get a "commission" for referring you. However, if you use my affiliate link to sign up you'll get an extra $10 bonus in your account, so it definitely qualifies as a win-win. Also, I would totally recommend this even if they didn't have any incentives. It's just that good. I was hesitant to try this one at first. It seemed like a lot of work and I wasn't really sure they'd have the products I wanted, but I decided to give it a go anyway. I'm so glad I did! For this one, you download a mobile app and scan the receipts when you go shopping (groceries usually have the best luck, at least for me). Ibotta offers "rewards" for specific items and, if you buy them and scan the receipt, the "reward" is added to your account. It's usually stuff like "$2 if you buy this brand of butter" or "$0.50 for any shampoo". Sometimes they even have little bonuses for buying any item in the store (jackpot). As was the case with Ebates, the link for Ibotta is an affiliate link. Again, you get a $10 welcome bonus too, just for using my link. So definitely take advantage of the extra cash! To be honest, the simplest and most consistent way to make money online is through actual hard work. If you have a skill, you can find people who don't want to do that thing themselves. I'm not talking about an "I'm a trained accountant" type skill, but rather a "I organize closets better than anyone" or "I use Canva like I was born to do it". If you can write, proofread, design, organize, advise, coach, or any of those other verbs you do all day long anyway, there is someone out there who badly doesn't want to do that thing themselves. The only hard part is finding them. I'm not going to sugar coat this, finding freelance clients is a pain in the neck. However, leveraging your actual talents to help take real tasks off the plate of an actual person who is too busy to do things themselves is the most surefire way to make money online. Do some digging on sites like Fiverr, UpWork, or FlexJobs and see what is a fit for your skill set. Try out the methods listed above for a few weeks. The first two are completely free and have under 5 minutes of setup time required. The last one is still completely free, but takes a bit longer to get going. And let me know in the comments how it works! Which one was your favorite? Did I miss any methods that you swear by? How much money did you end up making? I can't wait to hear your success stories!